Liczba stron: 299 Jest to ujednolicona liczba stron, która ułatwi Ci porównanie długości książek. Każda strona Legimi to 200 słów. The Children Railway is a children's book. Bobbie, Peter and Phyllis live in London with their parents. 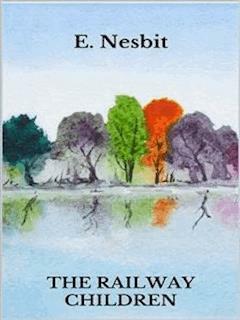 Their happy life is interrupted by the father's arrest and the country's move to his mother in a house near the railroad. The money is scarce and the children are worried. They spend a lot of time on the railroad, greet passengers of London-based trains. When a senior gentleman receives the greeting, Bobbie decides to ask for help from her father. A fun story, full of hope and love. Chapter I. - The beginning of things. Chapter II. - Peter’s coal-mine. Chapter III. - The old gentleman. Chapter IV. - The engine-burglar. Chapter V. - Prisoners and captives. Chapter VI. - Saviours of the train. Chapter VII. - For valour. Chapter VIII. - The amateur firemen. Chapter IX. - The pride of Perks. Chapter X. - The terrible secret. Chapter XI. - The hound in the red jersey. Chapter XII. - What Bobbie brought home. Chapter XIII. - The hound’s grandfather. Chapter XIV. - The End. They were not railway children to begin with. I don’t suppose they had ever thought about railways except as a means of getting to Maskelyne and Cook’s, the Pantomime, Zoological Gardens, and Madame Tussaud’s. They were just ordinary suburban children, and they lived with their Father and Mother in an ordinary red-brick-fronted villa, with coloured glass in the front door, a tiled passage that was called a hall, a bath-room with hot and cold water, electric bells, French windows, and a good deal of white paint, and ‘every modern convenience’, as the house-agents say. There were three of them. Roberta was the eldest. Of course, Mothers never have favourites, but if their Mother HAD had a favourite, it might have been Roberta. Next came Peter, who wished to be an Engineer when he grew up; and the youngest was Phyllis, who meant extremely well. Mother did not spend all her time in paying dull calls to dull ladies, and sitting dully at home waiting for dull ladies to pay calls to her. She was almost always there, ready to play with the children, and read to them, and help them to do their home-lessons. Besides this she used to write stories for them while they were at school, and read them aloud after tea, and she always made up funny pieces of poetry for their birthdays and for other great occasions, such as the christening of the new kittens, or the refurnishing of the doll’s house, or the time when they were getting over the mumps. These three lucky children always had everything they needed: pretty clothes, good fires, a lovely nursery with heaps of toys, and a Mother Goose wall-paper. They had a kind and merry nursemaid, and a dog who was called James, and who was their very own. They also had a Father who was just perfect, never cross, never unjust, and always ready for a game, at least, if at any time he was NOT ready, he always had an excellent reason for it, and explained the reason to the children so interestingly and funnily that they felt sure he couldn’t help himself. You will think that they ought to have been very happy. And so, they were, but they did not know HOW happy till the pretty life in the Red Villa was over and done with, and they had to live a very different life indeed. The dreadful change came quite suddenly. Peter had a birthday, his tenth. Among his other presents was a model engine more perfect than you could ever have dreamed of. The other presents were full of charm, but the Engine was fuller of charm than any of the others were. “What would you like?” Mother asked. He had an engine that he loved with all his heart and soul, and if he had a wish on earth It was to keep it whole. One day, my friends, prepare your minds; I’m coming to the worst - Quite suddenly a screw went mad, and then the boiler burst! For those who perished on the line He did not seem to care, His engine being more to him Than all the people there. And now you see the reason why Our Peter has been ill: He soothes his soul with pigeon-pie His gnawing grief to kill. He wraps himself in blankets warm and sleeps in bed till late, determined thus to overcome His miserable fate. And if his eyes are rather red, His cold must just excuse it: Offer him pie; you may be sure He never will refuse it. Father had been away in the country for three or four days. All Peter’s hopes for the curing of his afflicted Engine were now fixed on his Father, for Father was most wonderfully clever with his fingers. He could mend all sorts of things. He had often acted as veterinary surgeon to the wooden rocking-horse; once he had saved its life when all human aid was despaired of, and the poor creature was given up for lost, and even the carpenter said he didn’t see his way to do anything. And it was Father who mended the doll’s cradle when no one else could; and with a little glue and some bits of wood and a pen-knife made all the Noah’s Ark beasts as strong on their pins as ever they were, if not stronger. Peter, with heroic unselfishness, did not say anything about his Engine till after Father had had his dinner and his after-dinner cigar. The unselfishness was Mother’s idea--but it was Peter who carried it out. And needed a good deal of patience, too. So, then Peter told the sad tale, and fetched what was left of the Engine. “Hum,” said Father, when he had looked the Engine over very carefully. The children held their breaths. “Is there NO hope?” said Peter, in a low, unsteady voice. “CAN girls help to mend engines?” Peter asked doubtfully. Just then there was a knock at the front door. Ruth, she was the parlour-maid and had red hair, came in and said that two gentlemen wanted to see the master. “I’ve shown them into the Library, Sir,” said she. But Father did not seem to be able to get rid of the gentlemen at all quickly. Mother tried to make the time pass by telling them a new fairy story about a Princess with green eyes, but it was difficult because they could hear the voices of Father and the gentlemen in the Library, and Father’s voice sounded louder and different to the voice he generally used to people who came about testimonials and holiday funds. Then the Library bell rang, and everyone heaved a breath of relief. But instead of showing anybody out, Ruth showed herself in, and she looked queer, the children thought. Then Mother went into the Library. There was more talking. Then the bell rang again, and Ruth fetched a cab. The children heard boots go out and down the steps. The cab drove away, and the front door shut. Then Mother came in. Her dear face was as white as her lace collar, and her eyes looked very big and shining. Her mouth looked like just a line of pale red, her lips were thin and not their proper shape at all. “But you promised we should sit up late tonight because Father’s come home,” said Phyllis. Ruth brushed the girls’ hair and helped them to undress. (Mother almost always did this herself.) When she had turned down the gas and left them she found Peter, still dressed, waiting on the stairs. “I say, Ruth, what’s up?” he asked. Late that night Mother came up and kissed all three children as they lay asleep. But Roberta was the only one whom the kiss woke, and she lay mousey-still, and said nothing. When they came down to breakfast the next morning, Mother had already gone out. “To London,” Ruth said, and left them to their breakfast. “Did you ASK her?” said Roberta, with scorn. “I don’t think we ought to ask the servants things Mother doesn’t tell us,” said Roberta. “Of course. She always is. In her own opinion,” said Peter. “Who began, I should like to know?” said Peter. “Well, then,” said Peter, triumphantly. But before he went to school he thumped his sister between the shoulders and told her to cheer up. The children came home to one o’clock dinner, but Mother was not there. And she was not there at tea-time. It was nearly seven before she came in, looking so ill and tired that the children felt they could not ask her any questions. She sank into an arm-chair. Phyllis took the long pins out of her hat, while Roberta took off her gloves, and Peter unfastened her walking- shoes and fetched her soft velvety slippers for her. “As if we would!” said Roberta, holding Mother’s hand against her face. “We won’t quarrel. Indeed, we won’t,” said everybody. And meant it, too. Peter cringed and shuffled his boots on the carpet. “You’ll promise this, too, won’t you?” said Mother. “No,” said Roberta; “is it something to do with Government?” For Father was in a Government Office. Mother sighed and kissed them. “We’ll begin being good the first thing tomorrow morning,” said Peter, as they went upstairs. “Why not NOW?” said Roberta. “There’s nothing to be good ABOUT now, silly,” said Peter. The girls folded up their clothes with more than usual neatness, which was the only way of being good that they could think of. Everything continued to be perfectly horrid for some weeks. Mother was nearly always out. Meals were dull and dirty. The between-maid was sent away, and Aunt Emma came on a visit. Aunt Emma was much older than Mother. She was going abroad to be a governess. She was very busy getting her clothes ready, and they were very ugly, dingy clothes, and she had them always littering about, and the sewing-machine seemed to whir--on and on all day and most of the night. Aunt Emma believed in keeping children in their proper places. And they more than returned the compliment. Their idea of Aunt Emma’s proper place was anywhere where they were not. So, they saw very little of her. They preferred the company of the servants, who were more amusing. Cook, if in a good temper, could sing comic songs, and the housemaid, if she happened not to be offended with you, could imitate a hen that has laid an egg, a bottle of champagne being opened, and could mew like two cats fighting. The servants never told the children what the bad news was that the gentlemen had brought to Father. But they kept hinting that they could tell a great deal if they chose and this was not comfortable. One day when Peter had made a booby trap over the bath-room door, and it had acted beautifully as Ruth passed through, that red-haired parlour-maid caught him and boxed his ears. Roberta repeated this to her Mother, and next day Ruth was sent away. Then came the time when Mother came home and went to bed and stayed there two days and the Doctor came, and the children crept wretchedly about the house and wondered if the world was coming to an end. A whirling week of packing followed, not just packing clothes, like when you go to the seaside, but packing chairs and tables, covering their tops with sacking and their legs with straw. All sorts of things were packed that you don’t pack when you go to the seaside. Crockery, blankets, candlesticks, carpets, bedsteads, saucepans, and even fenders and fire-irons. The house was like a furniture warehouse. I think the children enjoyed it very much. Mother was very busy, but not too busy now to talk to them, and read to them, and even to make a bit of poetry for Phyllis to cheer her up when she fell down with a screwdriver and ran it into her hand. “Aren’t you going to pack this, Mother?” Roberta asked, pointing to the beautiful cabinet inlaid with red turtleshell and brass. “We can’t take everything,” said Mother. “But we seem to be taking all the ugly things,” said Roberta. When all the ugly useful things had been packed up and taken away in a van by men in green-baize aprons, the two girls and Mother and Aunt Emma slept in the two spare rooms where the furniture was all pretty. All their beds had gone. A bed was made up for Peter on the drawing-room sofa. As she turned away Roberta saw her face. She never forgot it. Next day boxes were filled, and boxes and more boxes; and then late in the afternoon a cab came to take them to the station. Aunt Emma saw them off. They felt that THEY were seeing HER off, and they were glad of it. They woke up, cold and melancholy, and stood shivering on the draughty platform while the baggage was taken out of the train. Then the engine, puffing and blowing, set to work again, and dragged the train away. The children watched the tail-lights of the guard’s van disappear into the darkness. This was the first train the children saw on that railway which was in time to become so very dear to them. They did not guess then how they would grow to love the railway, and how soon it would become the centre of their new life, nor what wonders and changes it would bring to them. They only shivered and sneezed and hoped the walk to the new house would not be long. Peter’s nose was colder than he ever remembered it to have been before. Roberta’s hat was crooked, and the elastic seemed tighter than usual. Phyllis’s shoe-laces had come undone. The walk was dark and muddy. The children stumbled a little on the rough road, and once Phyllis absently fell into a puddle, and was picked up damp and unhappy. There were no gas-lamps on the road, and the road was uphill. The cart went at a foot’s pace, and they followed the gritty crunch of its wheels. As their eyes got used to the darkness, they could see the mound of boxes swaying dimly in front of them. A long gate had to be opened for the cart to pass through, and after that the road seemed to go across fields--and now it went down hill. Presently a great dark lumpish thing showed over to the right. There was a low wall, and trees inside. “That’s the garden,” said Mother. “It looks more like a dripping-pan full of black cabbages,” said Peter. The cart went on along by the garden wall, and round to the back of the house, and here it clattered into a cobble-stoned yard and stopped at the back door. There was no light in any of the windows. Everyone hammered at the door, but no one came. The man who drove the cart said he expected Mrs. Viney had gone home. “You see your train was that late,” said he. “Oh, she’ll have left that under the doorstep,” said the cart man; “folks do hereabouts.” He took the lantern off his cart and stooped. “Ay, here it is, right enough,” he said. He unlocked the door and went in and set his lantern on the table. “Got e’er a candle?” said he. “I don’t know where anything is.” Mother spoke rather less cheerfully than usual. He struck a match. There was a candle on the table, and he lighted it. By its thin little glimmer, the children saw a large bare kitchen with a stone floor. There were no curtains, no hearth-rug. The kitchen table from home stood in the middle of the room. The chairs were in one corner, and the pots, pans, brooms, and crockery in another. There was no fire, and the black grate showed cold, dead ashes. As the cart man turned to go out after he had brought in the boxes, there was a rustling, scampering sound that seemed to come from inside the walls of the house. “Oh, what’s that?” cried the girls. “It’s only the rats,” said the cart man. And he went away and shut the door, and the sudden draught of it blew out the candle. “Oh, dear,” said Phyllis, “I wish we hadn’t come!” and she knocked a chair over. “ONLY the rats!” said Peter, in the dark. She struck a match and relighted the candle and everyone looked at each other by its winky, blinky light. The dining-room opened out of the kitchen. It looked much darker than the kitchen when they went in with the one candle. Because the kitchen was whitewashed, but the dining-room was dark wood from floor to ceiling, and across the ceiling there were heavy black beams. There was a muddled maze of dusty furniture, the breakfast- room furniture from the old home where they had lived all their lives. It seemed a very long time ago, and a very long way off. There was the table certainly, and there were chairs, but there was no supper. “Let’s look in the other rooms,” said Mother; and they looked. And in each room, was the same kind of blundering half-arrangement of furniture, and fire-irons and crockery, and all sorts of odd things on the floor, but there was nothing to eat; even in the pantry there were only a rusty cake-tin and a broken plate with whitening mixed in it. “Then shan’t we have any supper at all?” asked Phyllis, dismayed, stepping back on to a soap-dish that cracked responsively. The cellar door opened out of the kitchen. There were five wooden steps leading down. It wasn’t a proper cellar at all, the children thought, because its ceiling went up as high as the kitchen’s. A bacon-rack hung under its ceiling. There was wood in it, and coal. Also, the big cases. Peter held the candle, all on one side, while Mother tried to open the great packing-case. It was very securely nailed down. “Where’s the hammer?” asked Peter. And with these she tried to get the case open. “Let me do it,” said Peter, thinking he could do it better himself. Everyone thinks this when he sees another person stirring a fire, or opening a box, or untying a knot in a bit of string. Just then the first of the long nails in the packing-case began to come out with a scrunch. Then a lath was raised and then another, till all four stood up with the long nails in them shining fiercely like iron teeth in the candle-light. So, the girls lighted candles. The head of the first match flew off and stuck to Phyllis’s finger; but, as Roberta said, it was only a little burn, and she might have had to be a Roman martyr and be burned whole if she had happened to live in the days when those things were fashionable. Then, when the dining-room was lighted by fourteen candles, Roberta fetched coal and wood and lighted a fire. “It’s very cold for May,” she said, feeling what a grown-up thing it was to say. The fire-light and the candle-light made the dining-room look very different, for now you could see that the dark walls were of wood, carved here and there into little wreaths and loops. The girls hastily ‘tidied’ the room, which meant putting the chairs against the wall, and piling all the odds and ends into a corner and partly hiding them with the big leather arm-chair that Father used to sit in after dinner. The tablecloth was in a box with a proper lock that was opened with a key and not with a shovel, and when the cloth was spread on the table, a real feast was laid out on it. Everyone was very, very tired, but everyone cheered up at the sight of the funny and delightful supper. There were biscuits, the Marie and the plain kind, sardines, preserved ginger, cooking raisins, and candied peel and marmalade. “No, I won’t, Mother,” said Phyllis, and put it down among the Marie biscuits. And the toast was drunk in ginger wine and water, out of willow- patterned tea-cups, because the glasses couldn’t be found. They all felt that they had been a little hard on Aunt Emma. She wasn’t a nice cuddly person like Mother, but after all it was she who had thought of packing up the odds and ends of things to eat. It was Aunt Emma, too, who had aired all the sheets ready; and the men who had moved the furniture had put the bedsteads together, so the beds were soon made. Then she went to her own room. Roberta woke to hear the little travelling clock chime two. It sounded like a church clock ever so far away, she always thought. And she heard, too, Mother still moving about in her room. Next morning Roberta woke Phyllis by pulling her hair gently, but quite enough for her purpose. “Wassermarrer?” asked Phyllis, still almost wholly asleep. So, they dressed quietly and quickly. Of course, there was no water in their room, so when they got down they washed as much as they thought was necessary under the spout of the pump in the yard. One pumped and the other washed. It was splashy but interesting. The roof of the back kitchen sloped down quite low. It was made of thatch and it had moss on it, and house-leeks and stonecrop and wallflowers, and even a clump of purple flag-flowers, at the far corner. They lighted the fire and put the kettle on, and they arranged the crockery for breakfast; they could not find all the right things, but a glass ash-tray made an excellent salt-cellar, and a newish baking-tin seemed as if it would do to put bread on, if they had any. When there seemed to be nothing more that they could do, they went out again into the fresh bright morning. “We’ll go into the garden now,” said Peter. But somehow, they couldn’t find the garden. They went round the house and round the house. The yard occupied the back, and across it were stables and outbuildings. On the other three sides the house stood simply in a field, without a yard of garden to divide it from the short smooth turf. And yet they had certainly seen the garden wall the night before. It was a hilly country. Down below they could see the line of the railway, and the black yawning mouth of a tunnel. The station was out of sight. There was a great bridge with tall arches running across one end of the valley. So, they all sat down on a great flat grey stone that had pushed itself up out of the grass; it was one of many that lay about on the hillside, and when Mother came out to look for them at eight o’clock, she found them deeply asleep in a contented, sun-warmed bunch. They had made an excellent fire, and had set the kettle on it at about half-past five. So that by eight the fire had been out for some time, the water had all boiled away, and the bottom was burned out of the kettle. Also, they had not thought of washing the crockery before they set the table. The forgotten room opened out of the kitchen. In the agitation and half-darkness the night before its door had been mistaken for a cupboard’s. It was a little square room, and on its table, all nicely set out, was a joint of cold roast beef, with bread, butter, cheese, and a pie.